Okay, so I didn't really come up with a fantastic new angel food cake pudding. The title should read "FAILED" angel food cake ... but it reminded me more of a sticky toffee pudding consistency, or a yummy dense bread pudding, with the angel food cake flavor and a bit of the fluffy texture. Just a bit. 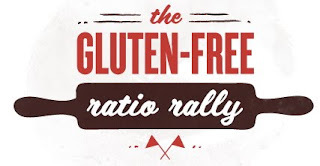 It's the Gluten-Free Ratio Rally again (many thanks to Caleigh of GlutenFreek for hosting us this month - see her host post where she gives links to the others here and below!). 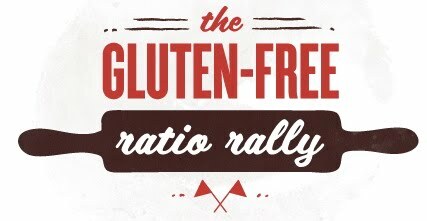 If you aren't familiar with the rally yet - or ratios (those magical numbers that give you ultimate freedom in the kitchen!) 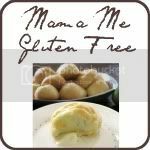 - you can check out my rally page here where I link to the first rally post written by Shauna of Gluten-Free Girl as well as provide links to all the other rally challenge posts I've written (and also include links for the three rallies I've now missed). For this challenge, I used Ruhlman's angel food cake ratio of 3:3:1 (3 parts egg white: 3 parts sugar: 1 part flour). Since I've missed the last two challenges due to summer travels and was home again (and away again by the time you read this!) for a little while, I thought I'd better get back into the swing of things and what better way than angel food cake, this month's challenge? Angel food cake is, after all, one of my favorite cakes. As a child, I was known to eat nearly an entire angel food cake myself on more than one occasion (and as an adult ...) - and I've made angel food cakes on more than one occasion as well. So, the day before new travels I decided I better bake one up. And got distracted. And mixed all the sugar together with the flour. If you're going to make any mistake when making this cake, this may be the worst of all. You need some of that sugar by itself to work into those fluffy egg whites. I realized my mistake before it was too late and could have remedied the situation, but decided I not only didn't want to waste ingredients, I really didn't have the time to mess with getting more ingredients out anyway (and I'm not sure I had enough sugar left, either). I decided to take my chances and slowly add the sugar/flour mixture but sure enough, it rapidly fell as I knew it would. There was no point folding the rest of the mixture in at that point - it was already a soupy mess - so I just mixed it all in and hoped for the best. After some of it dripped from the pan and burned in the bottom of the oven, it finally rose to the top of the pan and baked into a gorgeous angel food cake. I had high hopes ... until it had been cooling upside down (on my old pre-gluten-free-days Hornsby bottle saved on purpose to turn angel food cake pans upside down onto) and a peek showed that it had cracked into separate pieces and was shrinking away from the pan in a very odd manner. No worries - we pulled chunks out of the pan and ate them to discover it still tasted like angel food cake. A very dense, sticky one. So I made up a sauce to dribble over chunks of it and it made a fantastic angel food cake pudding. I'll do this again the correct way in the near future and share a real angel food cake with you. In the meantime, enjoy the pudding! Sift together sugar and flour. Whisk egg whites together at medium speed for about a minute. Add salt, cream of tartar, vanilla and almond extracts then increase speed to medium-high. Pour into 9-inch tube pan and bake (you may want to have a cookie sheet on the rack below your tube pan in case it drips!) for 35-40 minutes or until a nice light golden color on top and a cake tester or metal skewer comes out clean when inserted in center. The cake should have risen to the top of the pan and be deceptive in looking like a nice, fluffy cake. Turn pan over on glass bottle and let cool about an hour. Serve in chunks warm plain or with desired sauce, such as the cherry sauce, on top. Stir cherries, sugar and water together in small saucepan and heat over high heat until bubbling, then reduce to medium-high and cook for five minutes, stirring occasionally. Reduce heat to low and simmer for three minutes. Add almond extract, stir and continue to simmer for two more minutes. Let cool to nearly room temperature before serving. The sauce will thicken as it cools. I hope you're all having an amazing summer! When things settle down, I'll be back regularly and sharing my photos of beauty as well. Have a great week!